If you are a Tampa Bay Buccaneers fan, and went to last week's opening game against the Detroit Lions, you probably got more of a show than you expected, and I am not referring to the Fly-over, 911 tribute, or salute to the first and greatest Buccanneer, Mr. Leroy Selmon. A Bucs pre-season game caused major grumbling with tremendously long concession lines and very poor quality food. To make things worst, after waiting in these lines, fans were told that the credit card machines were not functioning. Imagine waiting in a food line for 45 minutes to find out that the cashless society was not welcome at this game. No cash...no food. Talk radio was a abuzz. "They had 9 months to prepare and make sure everything at Raymond James was ready." The stadium was less than half full. Imagine if a big crowd showed up. Levy foods, the concessionaire, took full blame for the fiasco. The Buccaneers responded by offering HALF OFF on all concessions for the opening day game. If you are not familiar with Tampa, FL in late August and early September (October, November, too), the word HOT is an understatement. The heat in a stadium is considerably more unbearable as the temperature on the field can be well over 100 degrees. How do the players deal with the heat? Lots of Water, Gatorade, and even IV's to rehydrate. How do the fans deal with the heat? BEER...and that's where the trouble starts! Most everyone knows that beer, while the commercials make it seem refreshing, is NOT a method of rehydrating your body. That takes water...and plenty of it. While most parents teach their kids the importance of drinking lots of water and staying hydraded in the heat, thousands of those parents seem to forget about it during game time, at the stadium. You can become dehydrated in just minutes while sitting in a 100 plus degree stadium, screaming, and expending lots of energy. There were numerous reports of faintings and heat related illnesses. While standing at a concession stand, the man next to me grabbed his female companion as her legs buckled beneath her. We sat her down, fanned her, and gave her small sips of water (Not Miller Lite) while waiting for the paramedics. While the football teams may have done the most running, the paramedic and support staff ran a very close 2nd assisting the many who got ill. During the game, Vendors carrying their boxes filled with beverages were up and down the aisles. While they had several varieties of ice cold beer...NO WATER! "Sorry, I'm Out", was what I kept hearing. Truth is, they don't want to sell you water. These guys and gals are working for tips and lets face it, they can sell a $4 bottle of water or $9+ bottle of beer. Beer customers will always tip better, too. So, they keep stocked with beer and skip the water, doing the fans a MAJOR dis-service. The most troubling thing to me, is much of this could have been easily prevented. The NFL, Tampa Bay Buccaneers Organization, and Food Vendors need to work together on a strategy to reduce or prevent this from happening. 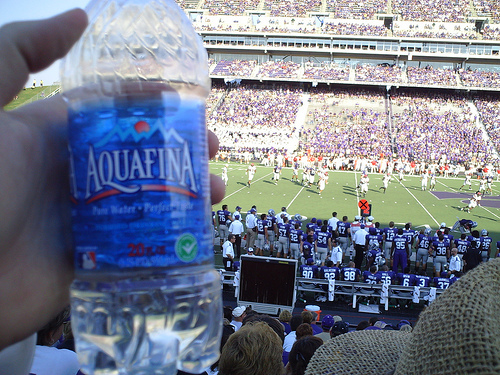 During the summer and early fall games, especially a 1pm kickoff, WATER SHOULD BE FREE! Yes...FREE! Fans need to keep hydrated and it is brutally hot, even in the breezeways and concession areas. 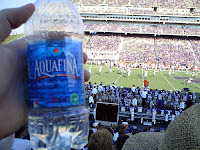 Rather than hand you a complimentary eye glass cloth, or other promo item, EVERYONE WALKING IN THE STADIUM SHOULD BE HANDED A BOTTLE OF WATER, FREE. That is the first step towards fan safety. Next, provide HYDRATION STATIONS, like the colleges do, so you can re-fill the bottles with COLD water throughout the day. 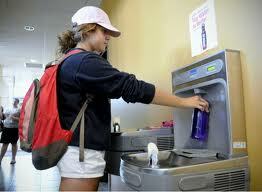 Refilling stations reduce the waste from plastic bottles as they promote re-use. If the stadium can't provide refilling stations, water should be free at all concession areas on game day. Signs should clearly posted throughout the stadiums warning of the possiblity of heat related health issues, showing where first aid stations are provided, and detailing possible warning signs to get help early to those becoming ill.
All Concession vendors working the stadium rows selling beverages should be required to carry plenty of water. Finally, while it's wonderful that this is America and everyone deserves to profit, how about NOT profiting on something like WATER. Fans have already paid hefty prices to attend the games. What is so terrible about charging $1 for a bottle of water? Why should we EVER have to pay $3 - $5 for WATER?? Charge $20 for a beer! Charge $100 for a hot dog! Don't rip off your own customers for something we need to EXIST! Of course, that's just my opinion...I may be wrong.